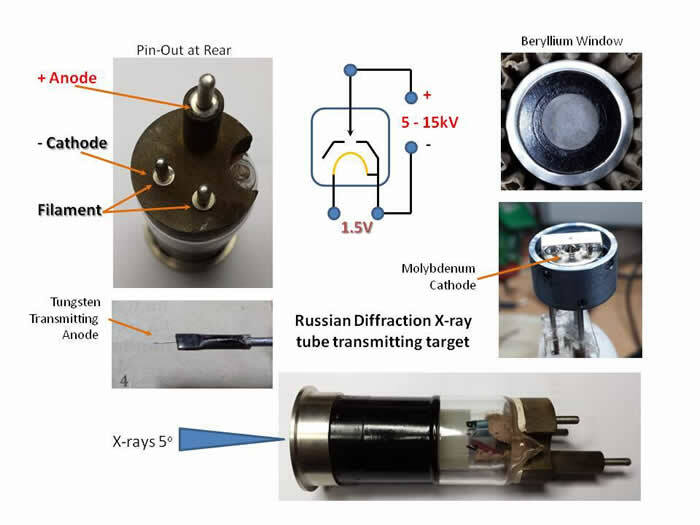 I bought the above X-ray tube for a X-Ray crystallography project I'm currently working on - It's called a diffraction transmitting target x-ray tube made in Soviet Russian times during the 1990s type BS7-W. They are available from a store in the Ukraine called Soviet Radio Components. Unfortunatly the english translated datasheet isn't that helpful other than some operating numbers. As there is no pin out information either, my first attempts to use the tube had mixed results. Nevertheless I was able to able to produce quite a nice fine beam of x-rays before blowing the filament. Although blowing the filament wasn’t really the best result, it did give me the opportunity to break open the tube and find out how it ticked. As it turned out this was a very worthwhile and interesting process, because it was not built in a way I expect almost the reverse. 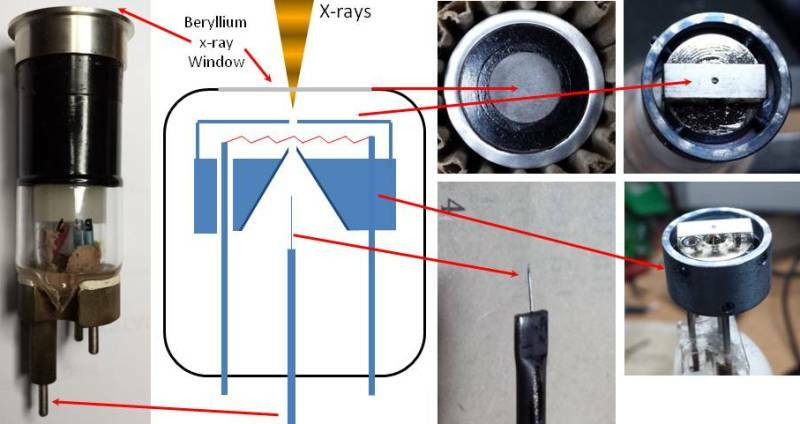 I was also left with a Beryllium x-ray window which I can use for the light screen in an x-ray detector. x-rays. But how it does this is a bit mysterious. 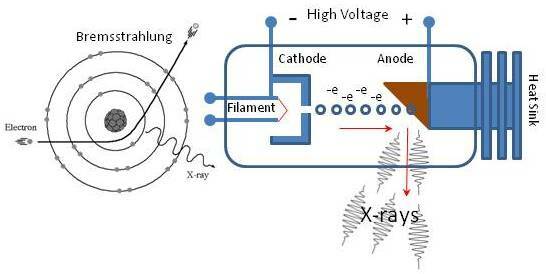 In a typical x-ray tube, X-rays are produced when a beam of electrons emitted by a filament in the Cathode are accelerated by a high voltage potential between the Cathode and Anode. The beam of electrons produced hit the Anode and are suddenly decelerated upon collision with the atoms in the metal Anode. These x-rays are commonly called brehmsstrahlung or "braking radiation". If the bombarding electrons have sufficient energy, they can knock an electron out of an inner shell of the Anodes metal atoms. Then electrons from higher states drop down to fill the vacancy, emitting x-ray photons with precise energies determined by the electron energy levels.